Yummo fabric, originally uploaded by indiaeden. I love a good cupboard clear out,and this week with Woody off work I've been having a jolly good tidy of our loft and my craft space. 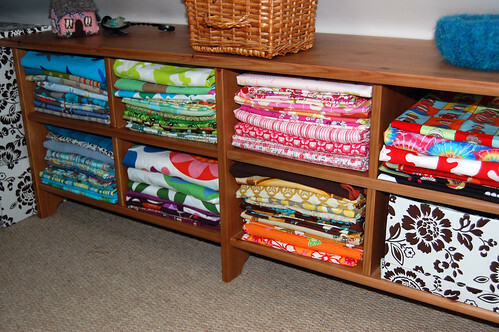 Woody has hung new rails in our wardrobe space,which has created lots more space for fabric...yay! My printed/pattern fabrics were all in an underbed storage basket,but I much prefer this,I can see at a glance what I have...it also looks a lot less this way! I've even re organised my scraps into small colour coded boxes. 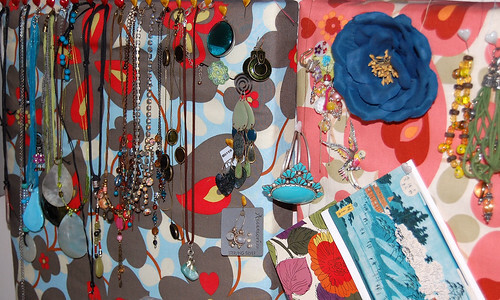 I've also sorted all my jewellery by simply pinning it to my fabric covered notice boards behind my desk. I like to look at all the sparkliness while I work,and it's so much easier now to wear a different necklace everyday. 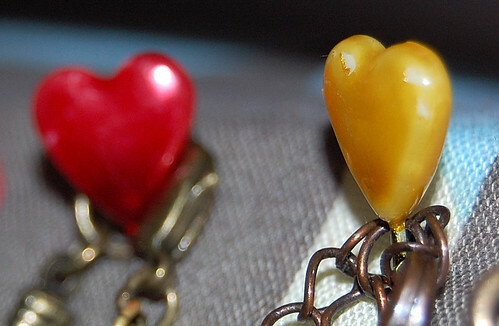 I used these cute heart headed pins,aren't they sweet? I got them from here. You have some lovely fabrics there... and I like the idea of hanging necklaces up, I get fed up of detangling mine!